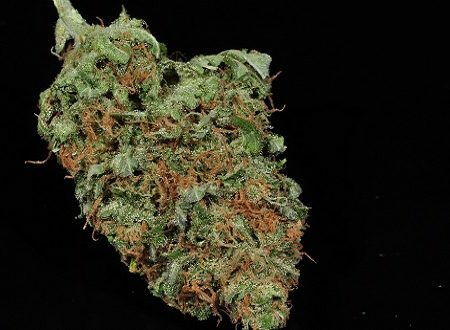 Bred by Rare Dankness as part of their Ghost Train Haze series pairing legendy OG Kushes with their Nevil’s Wreck (Arcata Trainwreck x Neville’s Haze) male, this strain redefined maximum potency when High Times tested it at the Cannabis Cup, being named the Strongest Strain on Earth. Universally loved by our staff, the aroma didn’t have any real hints of the Ghost’s OG side of the lineage, but that didn’t seem to matter at all. The scent is a wonderfully sweet yet fresh scent that has hints of anise, grenadine, and citrus mixed together into what several reviewers described as “cherry-limeade” or a similar sweet-tangy-tart combination. It’s very complex and engaging, and also has just enough of a bite post-grind to remind you of the OG and Haze lineage. Top-notch aroma here, one that Trainwreck and Haze lovers especially will enjoy. After the world-class aroma experience, it’s hard not to be slightly disappointed with the flavor, but this one held up very well. The flavor was a little more OG-tinged than the smell was, giving hints of the pine cleaner type of sharpness combined with a hint of the floral Haze sweetness. One this we really enjoyed about this strain was its extremely smooth smoking experience, which never really gave us the urge to cough and retained flavor to about the midway point of the bowl. 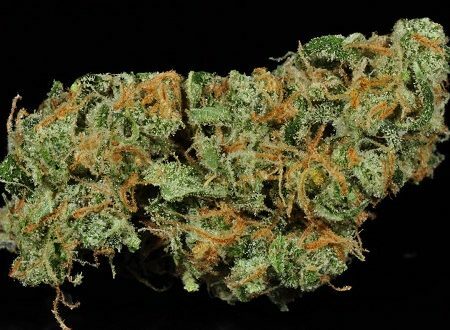 We had some slight disagreements on the overall potency of this hybrid among the review staff — some staff felt that it was in the top 10% of medicine potency-wise, while others (one of whom who has had the strain previously) thought that it just didn’t get to that upper level. 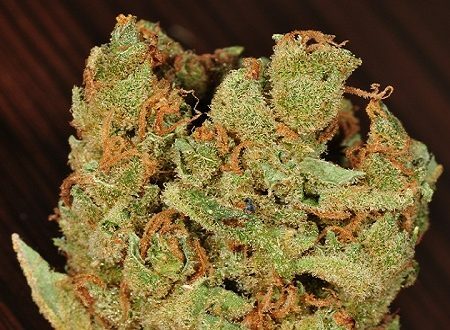 That said, the uplifting and energizing effects that kick off this experience will make any real Sativa-lover happy, but might border on anxious for those who struggle with the more energizing strains. A strong ‘facial mask’ feeling of buzzing pressure kept up at a high level, and our eyes tended to be rather red during the early parts of the duration especially… not a ‘stealth’ med really. Multiple reviewers reported quite a lot of borderline psychedelic activity, including slight auditory and visual hallucinations and at times felt a bit of sensory overload. At lower dosages than our standard KR review portion, the effect was more manageable and sociable, but otherwise it was a bit too challenging mentally to stay engaged with anything other than one’s own thoughts for the most part. The main effects began their decline at about 1.5 hours, but the energy and mental activity kept up through almost the end, when a little bit of a Sativa crash crept in and we felt a little stunted mentally and in a somewhat dreamlike mental state to finish.